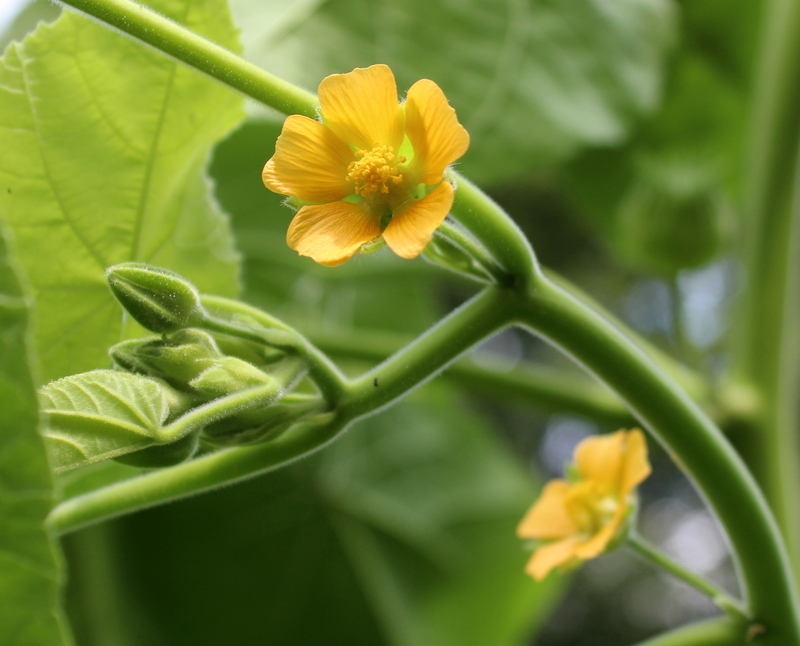 Another case of mistaken identity teaches us about Velvetleaf, Abutilon theophrasti, a foreign invader from Asia and a member of the Mallow Family. Early on in this gardening season there were several of what looked to be sunflowers growing where none were planted. Having seen volunteer sunflowers before around this garden we decided to just let them keep growing. It made sense for there’s a bird feeder nearby that is usually filled with sunflower seed and visited by many feathered friends. As the growing season continued it became evident that even though the “sunflowers” grew quickly and had huge heart-shaped leaves, something wasn’t right about them. The plants were soft to the touch! Now, real sunflowers don’t feel soft at all; they’re more stiff or rough to the touch. One of these plants was allowed to grow on where it started even though it was in the vegetable garden. We were careful to keep our eyes on it as it developed so we could get rid of it before the seeds were allowed to be dispersed. 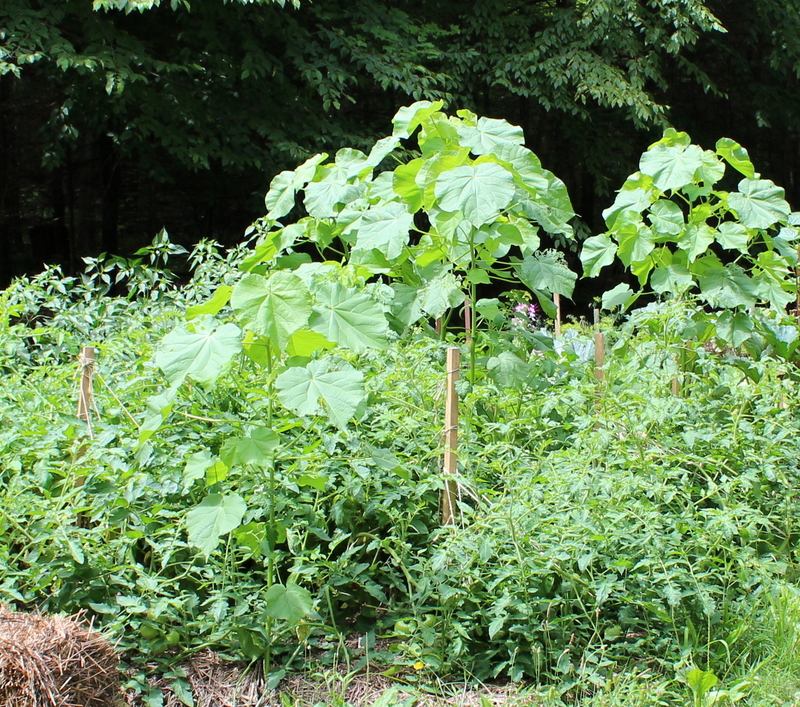 Velvetleaf is a fast grower and in good soil will attain a height of ten feet or more. 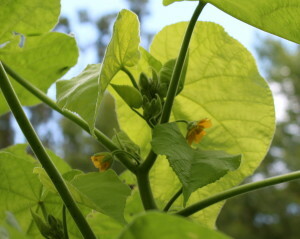 The heart-shaped leaves are large and on a tall plant get can a foot across. The sheer size of the plant made us think it would be a sunflower. So wrong. Ten-foot tall velvet leaf in the garden next to Italian tomato plants. Simple five-petal flowers are yellow-orange and they appear in the leaf axils of velvet leaf. They are about an inch in diameter. Sunflower blossoms are huge in comparison and composite at that. Simple flowers are borne in the leaf axils of velvet leaf. Five yellow-orange petals in Velvet Leaf flowers. Seed heads of velvet leaf are round and spiky-looking, not at all like the disc of seeds in a sunflower. When mature the seed heads turn dark brown to black before they release their seeds. At one time it was thought that Velvetleaf could be used as a source of fiber to make ropes, but that idea didn’t catch on. 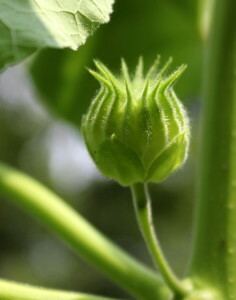 Even though the seeds are edible and provide oil when pressed, velvetleaf is mostly regarded as a weed in crop fields. When we see it appear on our land again – after all it’s an annual and the seeds had to come from somewhere – it will be pulled like a weed and tossed onto the compost heap. An identifying feature is that this weed has differently shaped cotyledons – one round and one heart-shaped cotyledon – so it can be recognized very early in the growing season. There is one useful thing to keep in mind about Velvetleaf once you know what it looks like. The whole plant is soft and velvety to the touch, so those big soft leaves can be used as survival toilet paper. 😉 Good to know!